I was just planning on picking up some chicken to make for dinner, but when I walked by the fish counter I saw the salmon and thought, what the hell. I never buy fish, and we really should eat it more often. Whisk together tamari, sesame oil, honey, fish sauce, garlic, and ginger. Place salmon filets in a shallow dish just big enough to accommodate them and pour the marinade over them. Let marinate in the refrigerator for about an hour. Preheat broiler (I used the toaster oven broiler). Remove the salmon, reserving the marinade, and broil until flaky, about 10-15 minutes. Meanwhile, heat olive oil in a large saute pan. Add garlic and saute for a minute. Add reserved marinade and bring to a boil. Add spinach and saute until wilted. 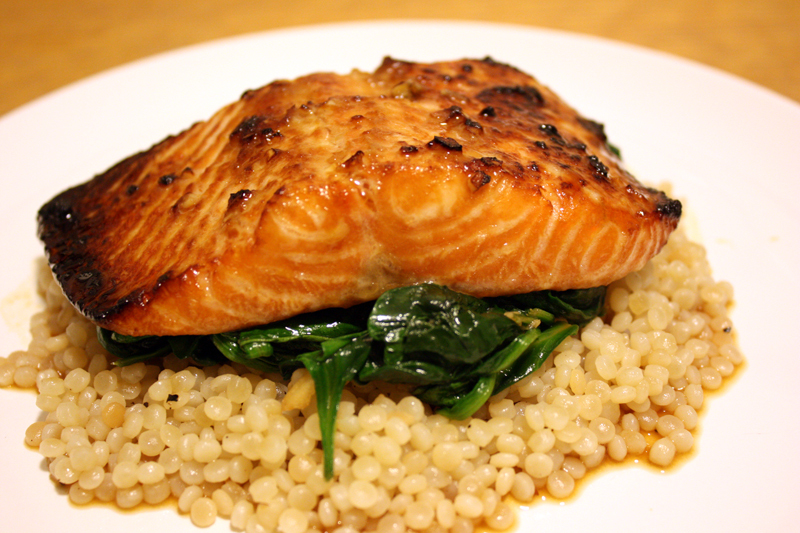 Serve the salmon over the couscous and spinach, spooning any extra sauce over top. On med. low flame, stir couscous around in frying pan for a few minutes without oil to toast couscous. Add appropriate amount of chicken or vegetable broth. Cover. Cook 10-15 minutes on low flame. When done, add slivered or sliced almonds and cranberries. Stir around. Enjoy! I have been looking for a recipe like this, I will have to give it a try.